* This kit will fit the 2007 Jeep Liberty, as well as some 2006 models. If your Liberty is a 2006, please be sure to check out the Applications section to find out if this kit will work on your vehicle. Let me guess... One of the front windows in your Jeep Liberty just made a snapping or grinding noise, the window no longer works, the glass wants to fall down into the door and you can move it up and down by hand? If so, then please allow me to be the first to welcome you to the club! The power windows in the Jeep Liberty are notorious for breaking in this manner. The problem is the design of the mechanism used to move the window. 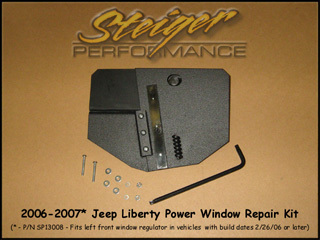 The Liberty uses a plastic window bracket that rides inside of a metal track in the door. As you use the window, the part of the plastic bracket that rides inside the metal guide rail tends to wear away until it becomes too thin to support the weight of the window, at which point it snaps and down comes the glass! Wear isn't the only reason for the failure of this part however - it is simply too weak. I know people who have had brand new window regulators installed and despite never using the window, the regulator broke anyway. To add insult to injury, the only option provided by Jeep to fix the problem is to replace the entire window regulator - guide rail, bracket, motor and everything, most of which are perfectly functional! The problem is a broken piece of plastic and the solution is to spend hundreds of dollars to replace the entire regulator? There is something very wrong with this picture. 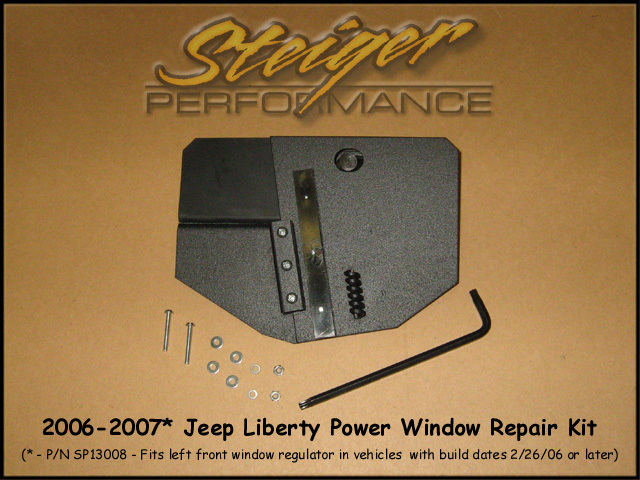 As if the situation weren't bad enough, if you visit your local dealership, you will learn that Jeep has discontinued the late 2006-2007 style window regulator, so if someone comes in with a broken one, what they have to do is to install a 2002-2005 style window regulator. (The person behind the parts counter may claim that it has been "redesigned", and there is indeed a new part number, but the fact is that its actually the exact same unit as was being installed on the assembly line back in 2002 - easily verified by comparing the injection moldings of the original factory parts to the "updated" version.) Unfortunately, this change also requires that the window be swapped out for the earlier style glass. Unless you are fortunate enough to be covered under warranty, obviously this makes an already expensive repair even more so. I am far too cheap to spend that kind of money to replace a mechanism which still has the vast majority of its parts in perfect working order. Besides, its the principle of the thing - breaking a little piece of plastic should not mean that an entire $200 mechanical assembly is now junk! In my opinion, a better solution would be to simply replace the part that is actually broken, and that is exactly what this repair kit allows you to do. In addition, my window repair kit is designed to work with your existing regulator and glass, so there is no need to purchase any additional parts. The main component of the kit is a window bracket that replaces the broken plastic one. It is constructed of steel and has a powdercoat finish, with nylon inserts for the wear surfaces. The stock spiral cable inside the regulator attaches to this bracket in exactly the same manner as the stock bracket. In order to install it, the regulator assembly is removed from the vehicle and dissassembled. The broken plastic bracket is discarded and the metal bracket included with this kit slides onto the regulator. The install requires only normal hand tools, with the most difficult part of the procedure probably being the removal of a small rivet on the regulator. If you have a drill, grinder or Dremel® tool, removing the rivet is actually not a big deal. If you don't have access to power tools, the rivet can technically be removed with a hand file, if you've got the stamina and the patience. All of the hardware that you will need is included, and I also include a Torx tool. (Some of the fasteners on the regulator use a T-20 Torx head which is not as common as the ubiquitous flat, Phillips or hex head. Although Torx bits and screwdrivers are readily available, supplying the tool in the kit may save you from having to make a trip to the hardware store in the middle of your project.) Also included is a four page, step-by-step installation guide with full color photos. For more detailed installation information, please refer to the installation instructions. They are provided in the kit and are also available on-line in Adobe PDF format. I stand behind my product and I want you to be happy with your purchase. Each kit is warranted to the original purchaser to be free from defects in materials and workmanship for as long as you own the kit. This repair kit fits the 2007 Jeep Liberty, and it will also work on a 2006 Liberty as long as it was built on February 26, 2006 or later. If you have a 2006 Liberty, you will need to know its build date in order to tell if this kit will work for you. Just in case you need some help in this area, I have put together a page explaining how to determine your Liberty's build date. This kit is not ambidextrous - there is a separate kit for the left and right windows. Part number SP13007 is for the right front door and part number SP13008 is for the left front door. This kit was designed to repair the power window regulator. 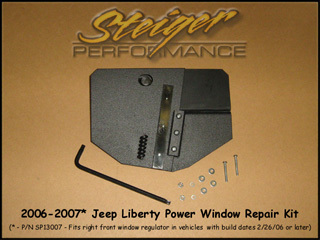 Manual windows were available in the Liberty, but this kit will not work on a manual window regulator. Which door is right and which is left? "Left" and "Right" as mentioned above are referenced from the perspective of someone sitting in the vehicle. (I try to avoid referencing the doors by "driver" or "passenger" side because this can vary from vehicle to vehicle - the driver's side door is on the left in the USA or Canada, but it would be on the right in the UK or Australia.) If you are having difficulty determining whether you need the left front or right front kit, the easiest way to think of it is to picture yourself sitting in the vehicle. You can also refer to the diagram below, which shows a bird's eye view of a Liberty and identifies each door. As mentioned above, Jeep no longer makes a 2006-2007 style replacement regulator, so when a window regulator must be replaced on these vehicles, they are installing the 2002-2005 style window regulator and glass. This is important, because if the window regulator and glass in the door you are looking to repair has been changed out, this kit will not work, you need the repair kit for the earlier model Liberty instead. Unless you are certain that the window regulator in question is the one that was originally installed at the factory, you should verify that you still have the late 2006-2007 style regulator and glass. When a dealership replaces the regulator and glass, they are supposed to apply a decal which alerts other service techs to the change. This decal is shown to the right. If you find one on your door, that means your regulator and glass have been swapped out, and you will need to use the 2002-2006 style kit instead. If you find this label on your door, the 2006-2007 style repair kit will not work - you will need to use the 2002-2006 style instead. It is conceivable that your door components could have been swapped out at some point but the label was not applied. If you want to make absolutely certain as to which version is installed in your Liberty, the only sure-fire way is to actually take a look inside the door. Are you confused yet? Don't worry, you are not alone! If you are not sure which kit you need, please use my Jeep Liberty Window Regulator Repair Kit Wizard. It will guide you through a series of questions and show you which kit you need. 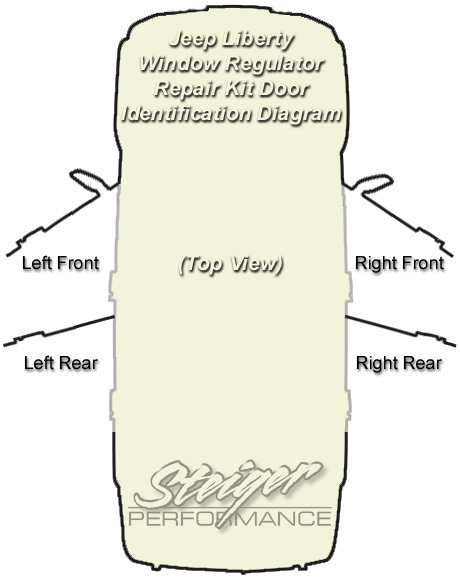 Also available is my Jeep Liberty Window Regulator Spotter's Guide which allows you to determine which kit you need based on what you actually see installed in your door. * - Please use the wizard and/or the spotter's guide so that you can be sure to order the correct kit for your vehicle.